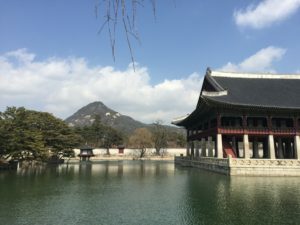 So how did I end up in Seoul teaching seminars in the middle of their winter? 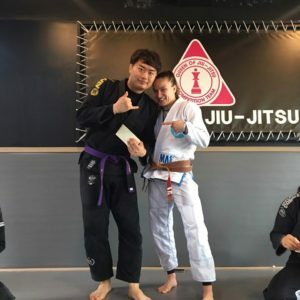 Well, a little while ago I posted my love for Korean food on Instagram and as a result started chatting to a purple belt named Jes who lives in Seoul as an ex-pat. 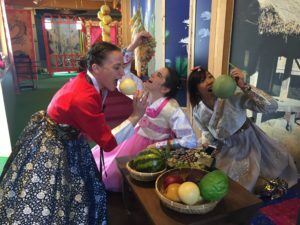 Before I knew it we were plotting and planning how I could come and teach and eat all their delicious food at the same time. Pretty much a dream scenario! 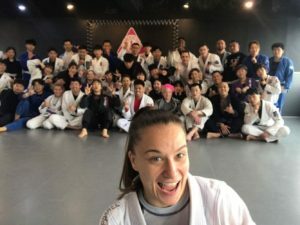 We planned my trip to coincide with the ADCC Trials in Tokyo, as it’s only a short flight from Japan. 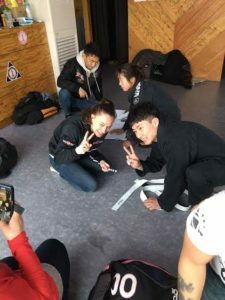 I will be forever indebted to Jes who organised my seminar including a translator, connected me with people, gave me a place to stay and was a constant source of laughs. 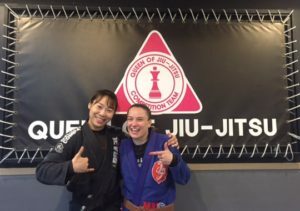 I couldn’t be more grateful to the one and only Heejn Lee, who is Korea’s first and only female black belt for hosting me at her own academy Queen of Jiu Jitsu. 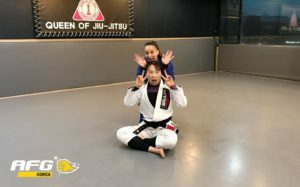 Heejin is a pioneer and pretty much started women’s BJJ in South Korea from scratch. I cannot put it into words how badass this woman is and how much I look up to her. 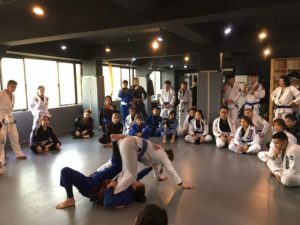 I flew to Seoul straight after the trials, which gave me 5 days to sight-see and train before my seminars. 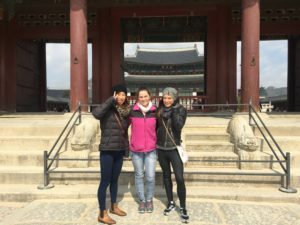 My teammates Sarah and Chi joined me for a training holiday, which made the trip infinite times better. 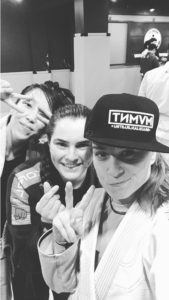 They are both the best company I could ask for and also incredible training partners. 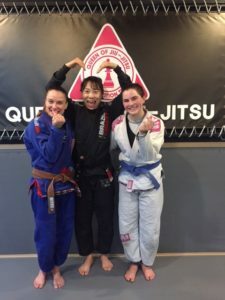 It was pretty nice to share this BJJ journey with them. 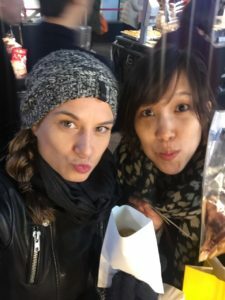 We did lots of fun stuff like exploring the markets and buying way too many socks and face masks, beauty products and street food. 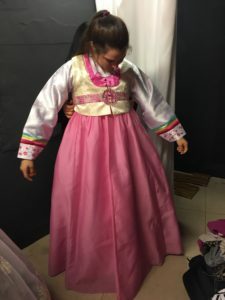 We also managed to dress up in traditional Korean dresses. 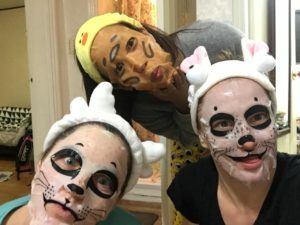 I am sure the shop owner’s only goal was to make us look as hideous as possible, but we embraced it. 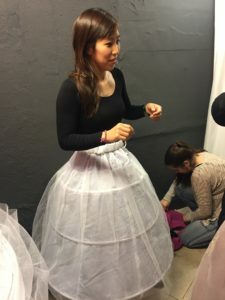 Sarah’s marshmallow dress definitely topped the fashion world rankings. 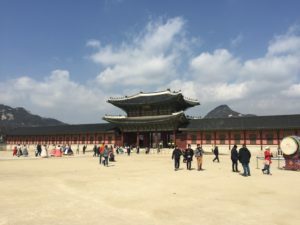 We also visited the Gyeongbokgung Palace, which was beautiful and so well preserved. 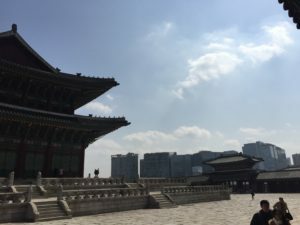 The contrast between the old temples set on the background of mountains and the modern sky scrapers was striking. 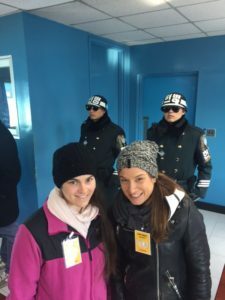 One of the things I will remember forever is our visit to the Demilitarized Zone (DMZ). 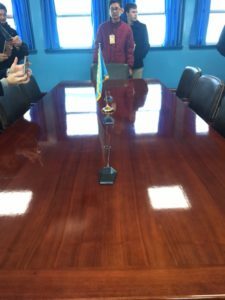 We did the Panmunjom Tour (Joint Security Area) which was a half day trip. 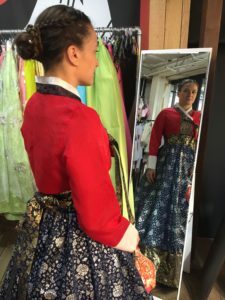 On the bus to the JSA, we had a North Korean defector with us who answered all questions that were asked of her about her escape and life in North Korea. It was all shocking and sad and I still can’t get over how life can be absolute hell for someone just a few miles away from where we stood. 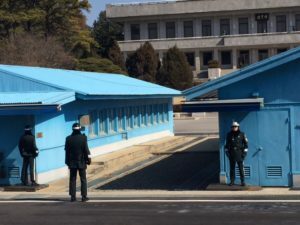 Once briefed by the UN soldiers we finally entered the border between North and South Korea. 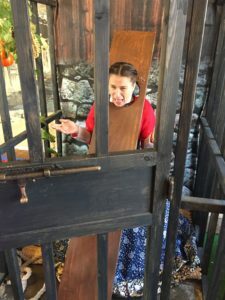 The rules and orders to us were strict and you could literally feel the tension in the air. I didn’t quite expect it all to feel so heavy,sombre and real. On the way back we stopped and paid tribute to the families that got separated when Korea was divided and never saw each other again. 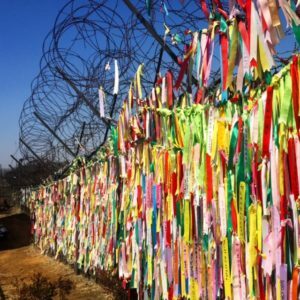 They left messages to each other written on ribbons that dance in the wind. 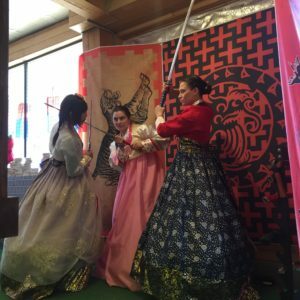 This trip has left me with a lot to think about and I would recommend it to anyone. On a lighter note, we got to do a lot of training and met some amazing people in the process. 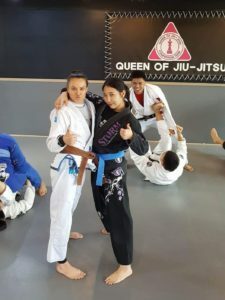 I loved training at Queen of Jiu Jitsu with Heejin. 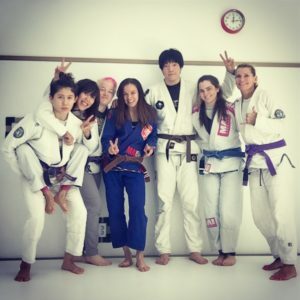 I really enjoyed her teaching and also her top game is world class amazing. I was lucky that she let me specific train playing guard and her passing me, just so I could absorb as much of her goodness as possible. 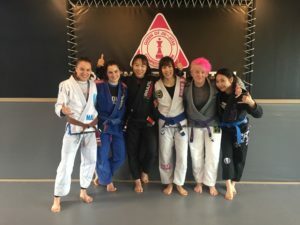 We also had some really fun rolls with the small purple belt men and very technical blue belt ladies. 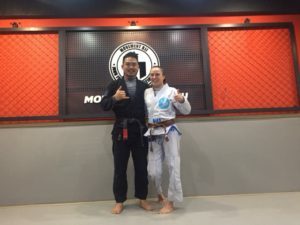 During the week we were also visited my old Absolute teammates Jay’s school Movement BJJ. 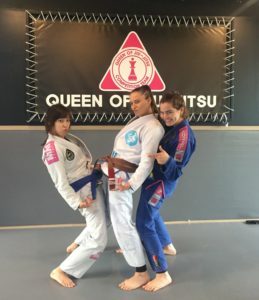 Last time we rolled was in Australia when he was a purple belt and I was blue, and it was wonderful to see his school becoming so successful. 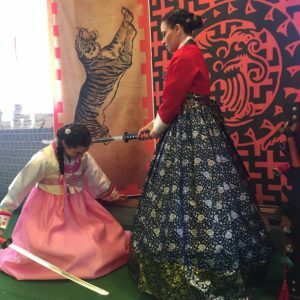 Kris Kim also welcomed us at his school where the vibe was relaxed and fun, yet at a very high level. 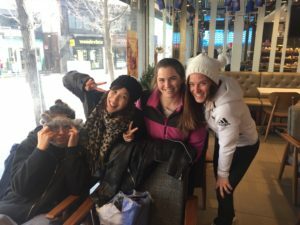 Thank you to Nat (another ex-pat) for taking time to take us to dinner after training and just generally being fabulous. 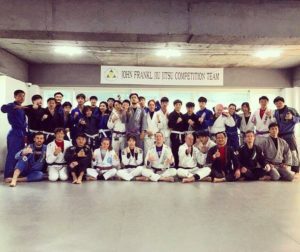 On Friday we were invited at John Frankl’s competition training. 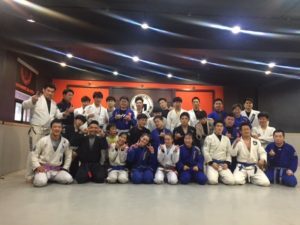 John is a pioneer of BJJ in South Korea and is a truly wonderful, kind and a wise man. Check out this short video about his story here. 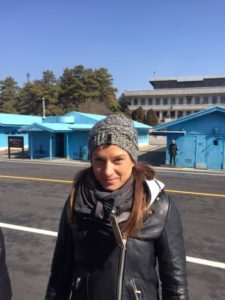 Korea was freezing. Me no like. 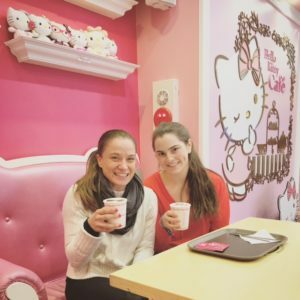 It was a treat to catch up with my friend Margot on Saturday morning, as she stopped over in Seoul for a few hours before flying to LA for Pan Ams. 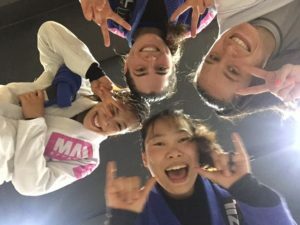 It makes me smile to think at how many random places we have travelled to and trained at together. 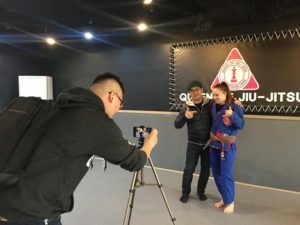 Thank you to Chuck of Seorae Jiu Jitsu for opening his gym to us so Margot could drill a little before she had to head back to the airport. 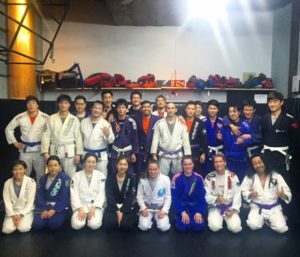 It was finally time for my first seminar on Saturday. 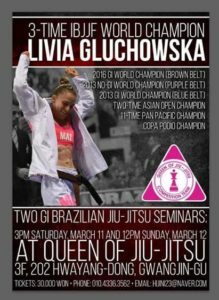 It was held at Queen of Jiu Jitsu and I never expected so much interest and so many people to turn up. 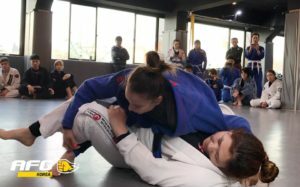 We had 47 on the mat raging from white to black belt, male and female. 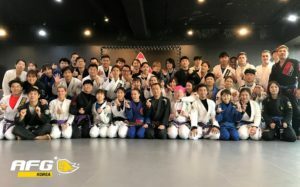 Special mention goes to the Asia Fight Guide team who was my media partner for the seminar and took photos, recorded techniques and interviewed myself and Heejin. 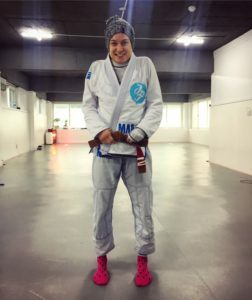 It is so nice to see women finally being taken seriously and equally in the BJJ community. 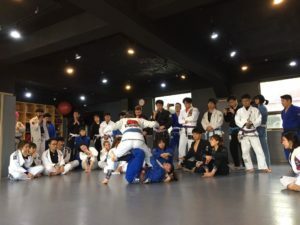 During the seminar, the mats were so full I even had to modify and change the content as I went because there was no space to execute some of the sweeps. What a good problem to have! 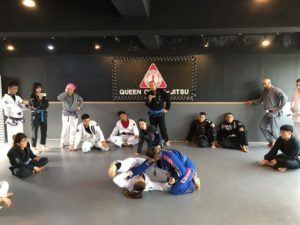 I taught single x and x guard variations and passed on some of the details that I had to develop throughout the years as a small fighter. I taught in english but each sentence was translated by Libby and she did not skip a beat. She even did a good job at doing my weird analogies and pathetic jokes some justice. After the seminar we got taken out for delicious BBQ and where I ate the whole cow and a pig and then some. At least it did give me energy for the next day’s seminar. 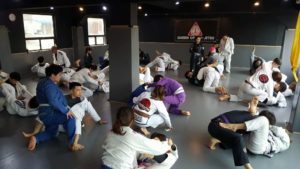 Sunday saw more than 40 people flood the mats again and this time I taught spider guard recovery and attacks. 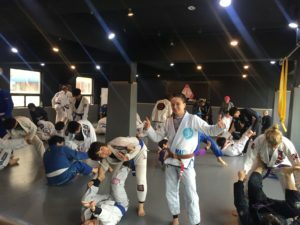 After the seminars we raffled off some prizes donated by Heejin’s sponsors and notes of encouragement/inspiration which I wrote. We took many photos and I signed people’s belts and gis, which was completely nuts. Safe to say my first international seminar was a big success. 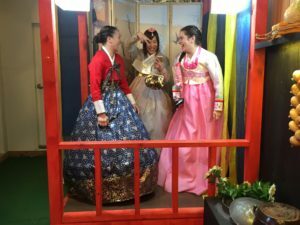 It was such an awesome cultural experience, but most of all I had a lot of fun. 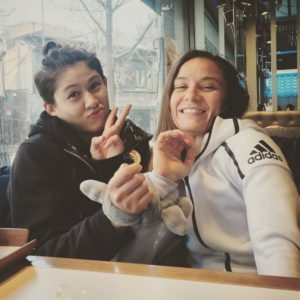 I am forever thankful to Heejin for not only hosting my seminars but also for teaching me, taking us sight-seeing, feeding us, providing massages and for some beautiful and technical BJJ. Thank you to Jes for organising everything, making this trip actually happen and for being the best mamma around. Thank you to Libby who was a wonderful and a patient translator and a very kind human. Nat deserves a medal for the rolls, laughs and dinner. John Frankl and everyone who welcomed us to their academy with open arms- I do hope I can return the favour one day. 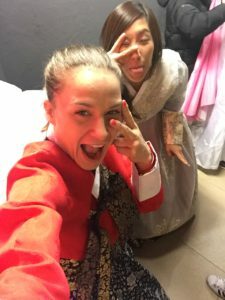 And of course Chi and Sarah – training, competing and life is so much better with your silly in it. 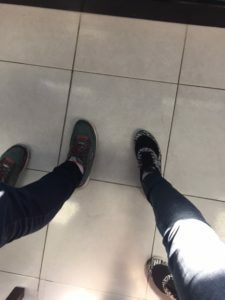 Your company means the world to me, and one day I hope to travel the world with you as you teach in weird and wonderful corners of the world. 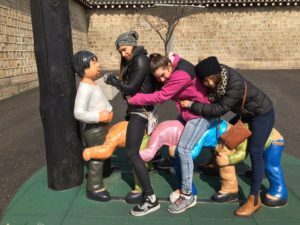 Me, Sarah, Heejin, Chi, Jes and Libby. 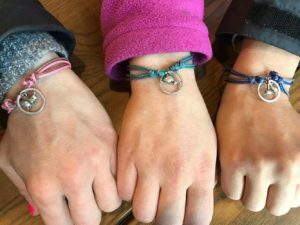 We did it!